Out of Switzerland’s 26 Cantons, Graubünden is the largest and one of the most scenic. Located in south east Switzerland, Graubünden is home to some of the most beautiful Alpine scenery in Europe, including the Engadin Valley and glamourous resort of St Moritz. From the Bernina Express and its astounding bridges to the historic town of Chur with its tempting food scene, there is so much to discover. Graubünden is the only official tri-lingual Canton, speaking Swiss German, Italian and Romanish. The highest point is a staggering 4,049m above sea level at Piz Bernina. The first snow of the season is an enchanting experience. Within hours of our arrival snow began to fall painting the mountaintops. 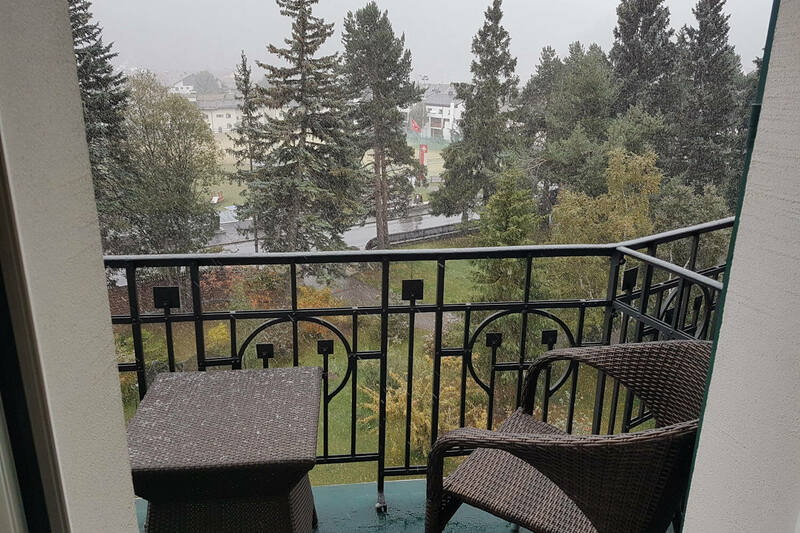 At nearly 1,714m in altitude, the snow quickly settled and fell heavy, yet the air remained warm and fresh. Watching it from my own balcony was a magical experience indeed. 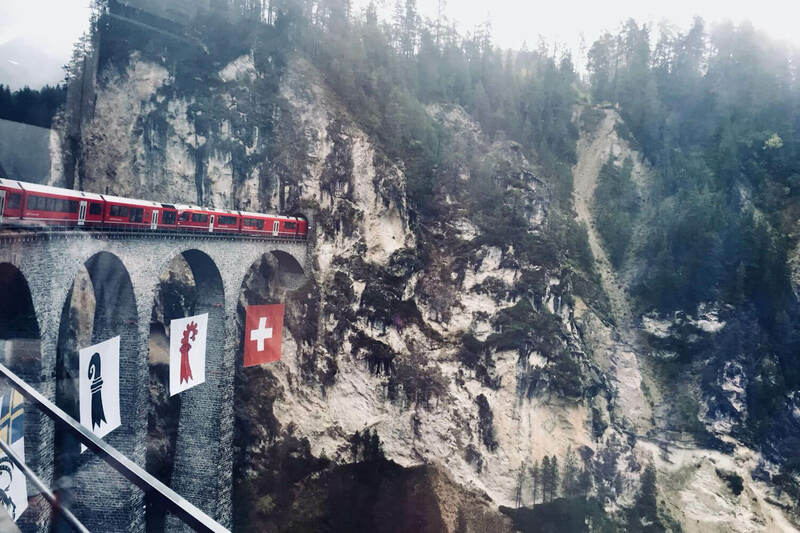 Switzerland is well known for its stunning rail journeys. As we traversed through mountainous scenery and past shimmering lakes, it was phenomenal how often you could witness the train as it winded around the mountains. The most wonderful thing about rail travel in Switzerland is the sheer levels of comfort, particularly in first class. Watching some of Europe’s most beautiful scenes simply float by through panoramic windows is a truly unique way to explore a country. 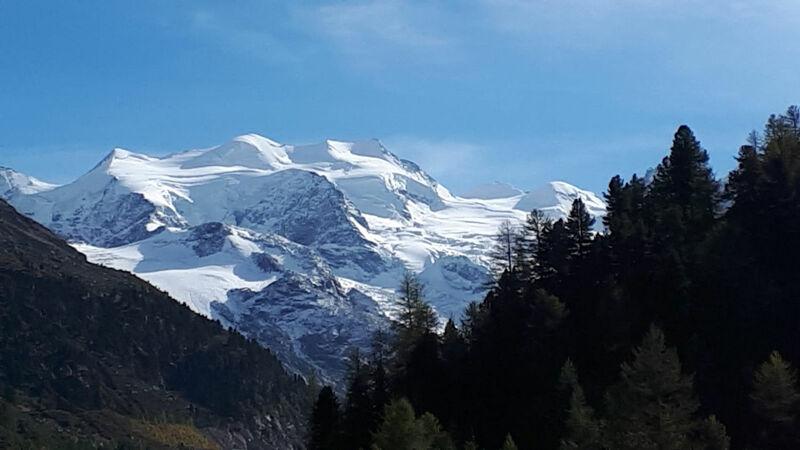 Along the Bernina route through Graubünden, you’ll glide past glaciers including the Roseg Glacier. Roseg is 4km long but has halved in size since its first measurement in 1973 when it had an area of 8.5km2. 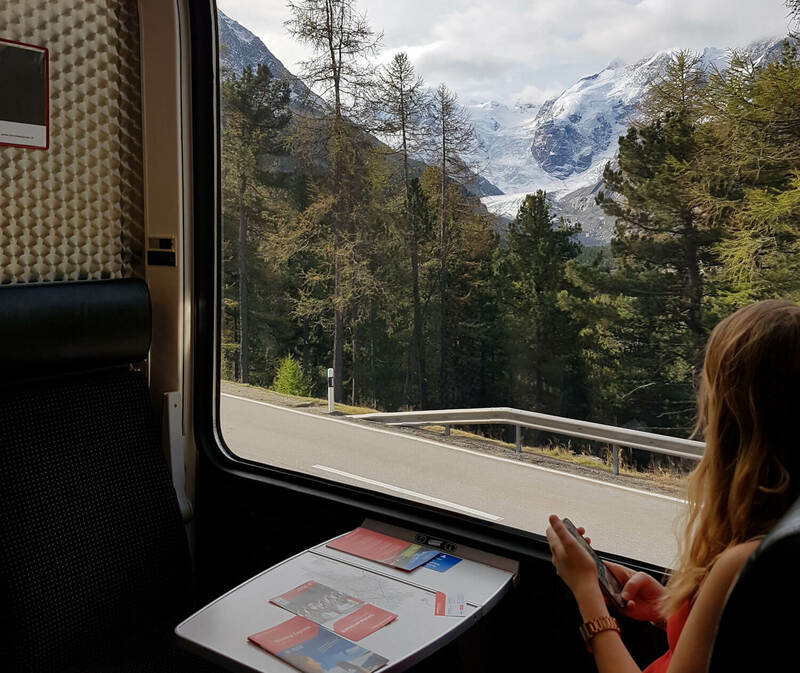 Along the rail route you will also witness the Morteratsch Glacier, which is the largest in the Bernina range and the third largest by volume in the eastern alps. It’s no secret that Switzerland is superb for walkers and the Graubünden region is no exception. 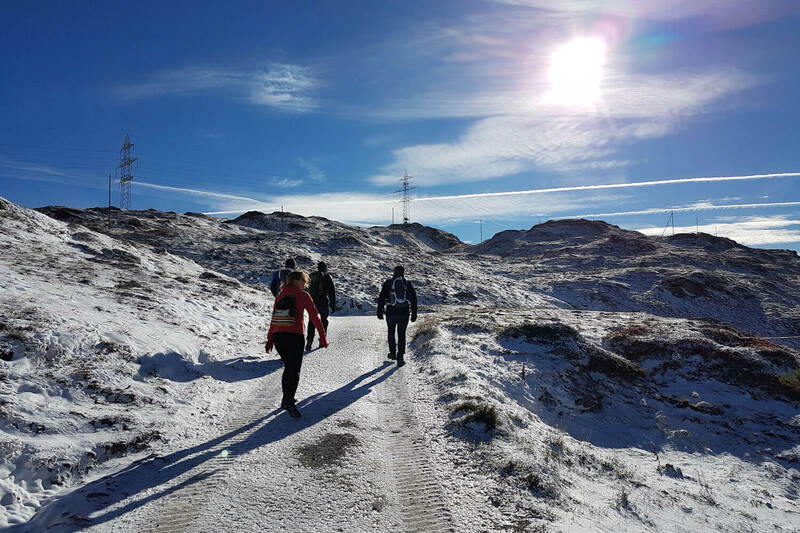 There is a huge array of hiking routes for all levels including the mild hike from Ospizio Bernina station to Hotel Belvedere. 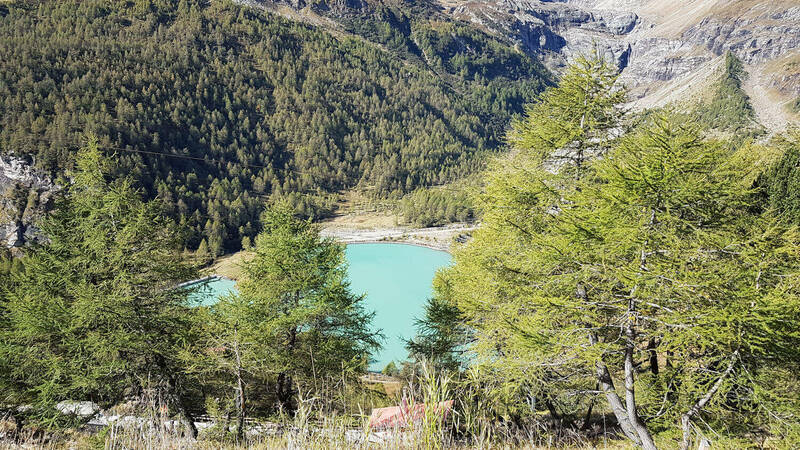 The hike took around 2 hours and included a gentle stroll around the glacial Lago Bianco and onwards above a valley with extraordinary views of the Bernina Range. 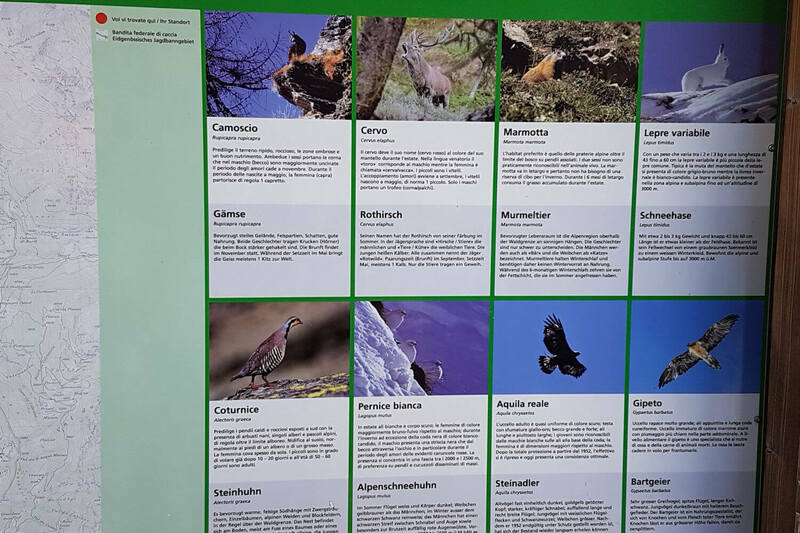 The Swiss Alps are home to a plethora of animal species. On our hike we were introduced to the thrilling range of wildlife we may come to pass, although unfortunately we weren’t lucky enough to spot any. Lago Bianco is a glacial lake located on the Bernina pass. As the water is fed directly from a glacier, the water is incredibly clear, cold and turquoise in colour. Prepare to be amazed by the views that welcome you. 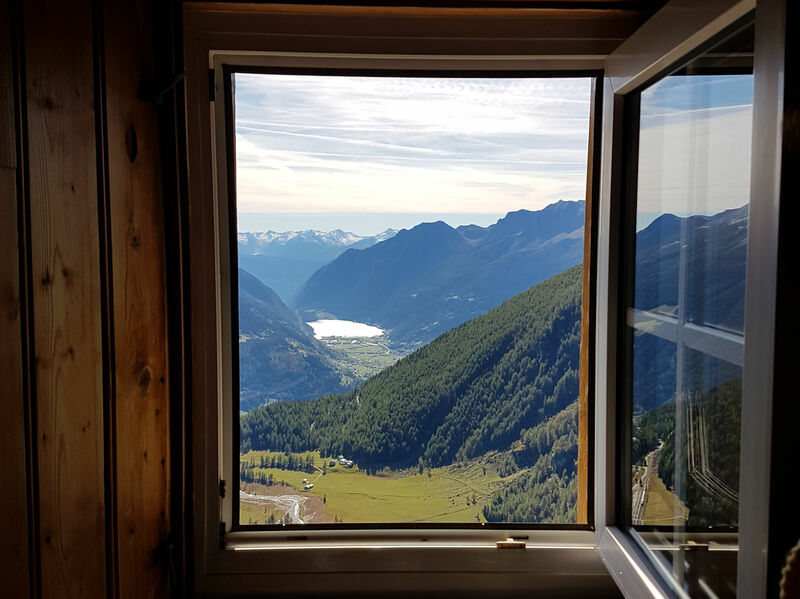 On a clear day you can easily see across a beautiful Swiss valley to Lago di Poschiavo and beyond to the mountains of Italy. The Hotel Restaurant Belvedere at Alp Grüm is the perfect place for lunch after a hike. Whether you stay the night or simply stay for lunch you’ll be assured some of the best views in the region and a warm welcome from the friendly owners. The Palü Lake is situated below the Hotel Belvedere. 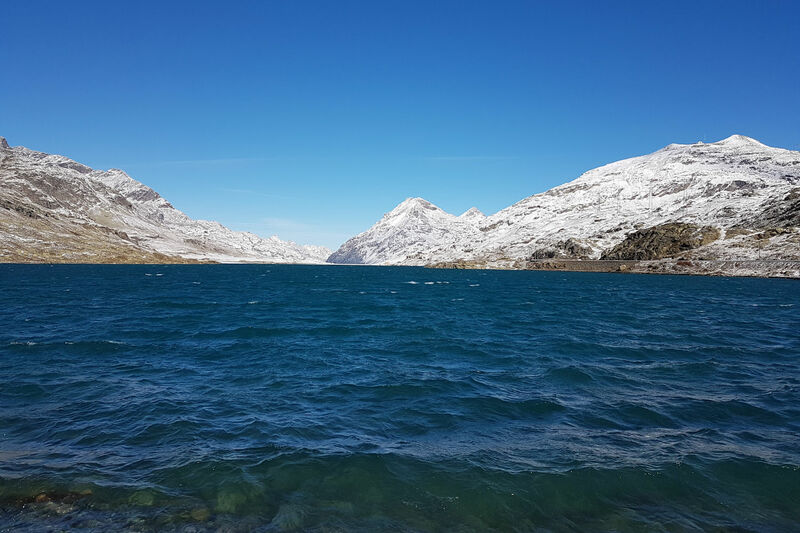 The water is fed directly by waterfall from the Palü glacier creating a translucent colour water. In 1926 a dam was built to enable the lake to be used as a reservoir. 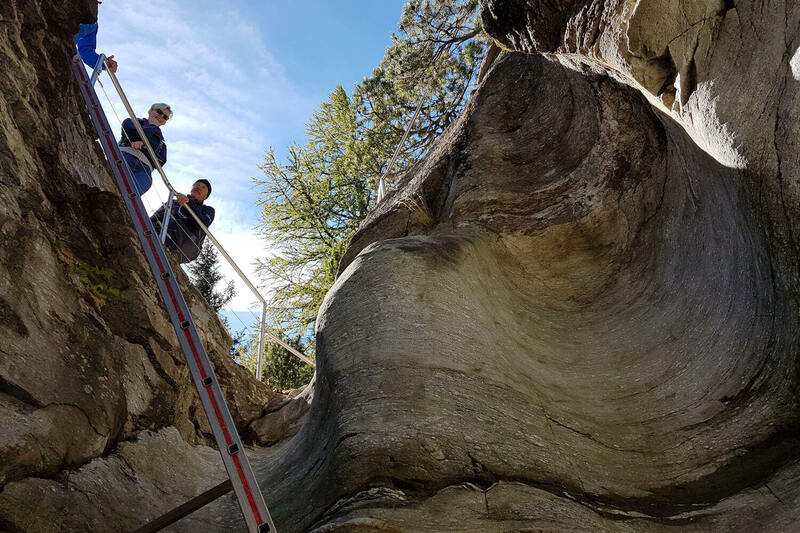 For any geologist or geographers, a visit to the Cavaglia Glacier Garden is a must. Over thousands of years glaciers have moved along stones, large and small, which gauged pot like holes in rock forming ‘glacial mills’. The mills range in shapes and sizes from 10cm deep to 15m deep with more to be uncovered. Even today the glacier still feeds water though Cavaglia creating beautiful waterfalls and a heart shape rock formation. There is also a fountain where you can fill your water bottle with water straight from the glacier, which is as fresh as it gets. The glamorous resort of St Moritz is home to designer shops and boutiques, superb hotels and an exclusive atmosphere. 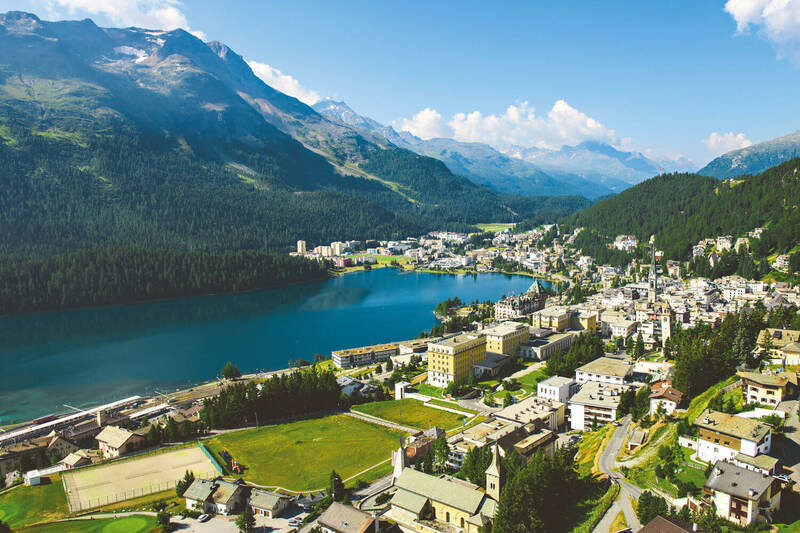 In summer time the St Moritz Lake comes to life with watersports, swimmers and bathers as well as cyclists, hikers and climbers who come here to explore the region. The Diavolezza restaurant specialise in cheese fondue, and there’s no experience quite like it. 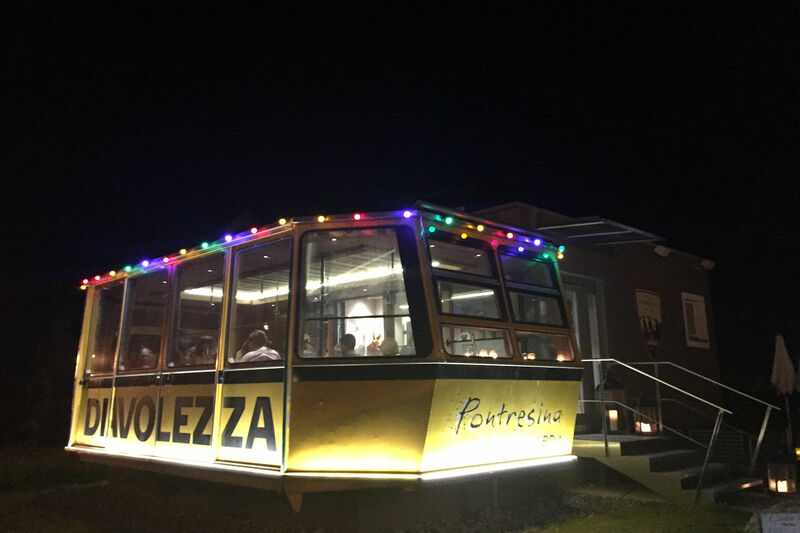 The old cable car was converted to a restaurant in Pontresina, which provides a unique and unforgettable way to enjoy a traditional Swiss dish. 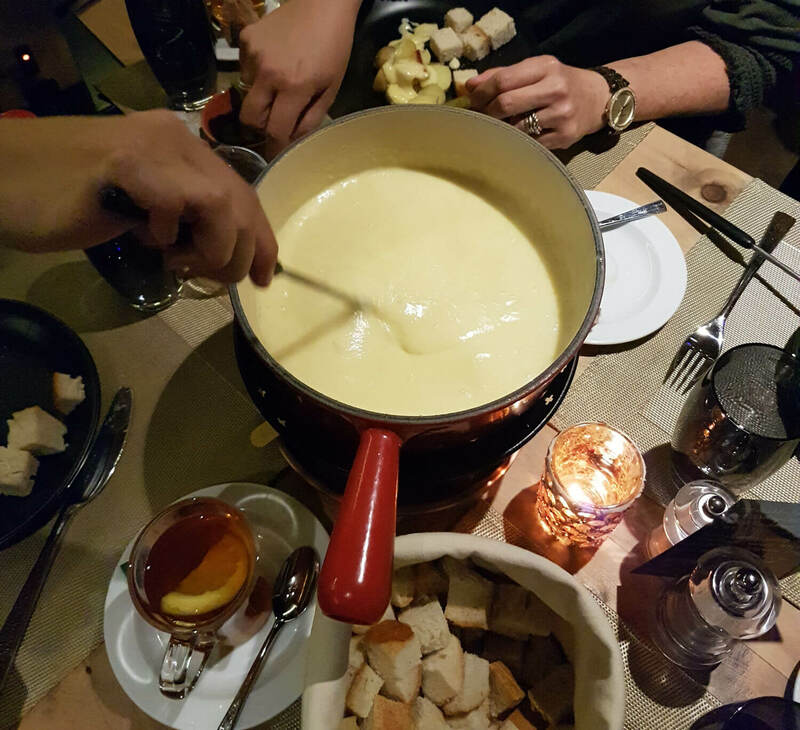 A trip to Switzerland can’t be complete without a taste of cheese fondue. This sociable meal is as simple as its sounds; bread, melted cheese and hot tea, delicious! We can certainly understand why the Swiss love it so much. What stood out for me was the plethora of stunning alpine buildings that still stood today. The wonderful region had managed to keep its quintessential Swiss architecture. 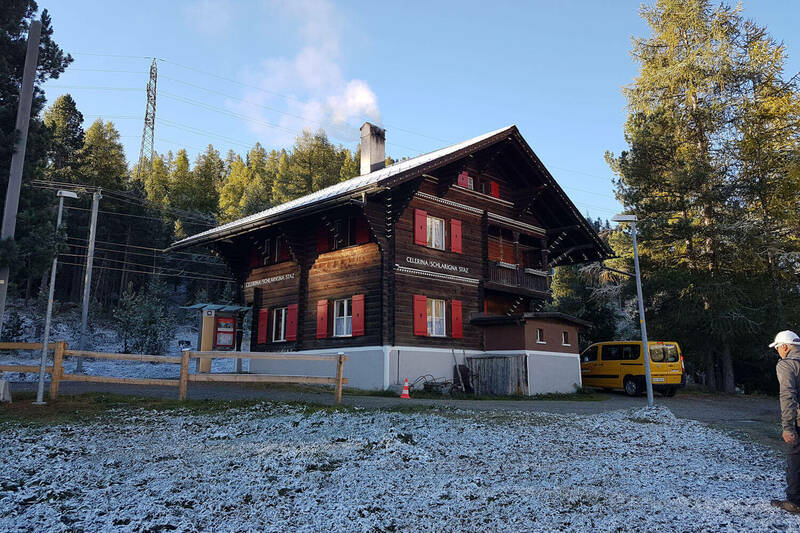 Here is the train station of Celerina and its delightfully alpine chalet. The Bernina Express is a truly magnificent experience. 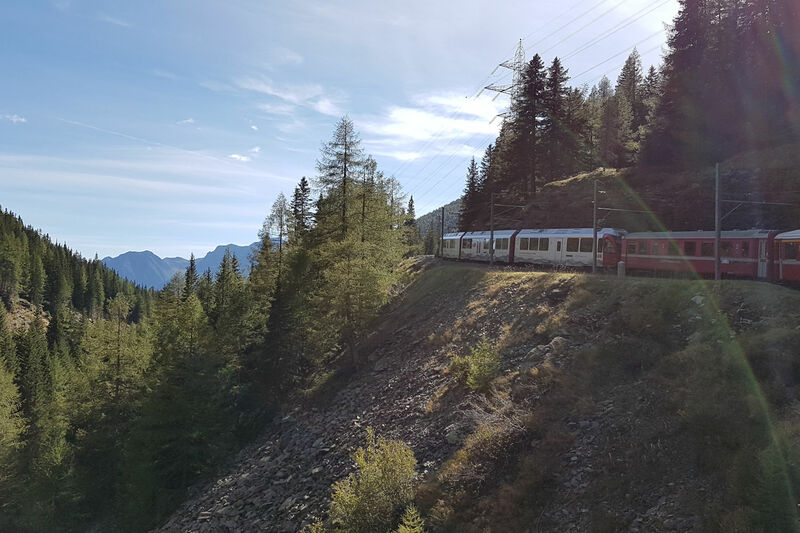 The luxurious train from St Moritz to Tirano glided through jaw dropping landscapes, architectural masterpieces and high up mountainous scenery. 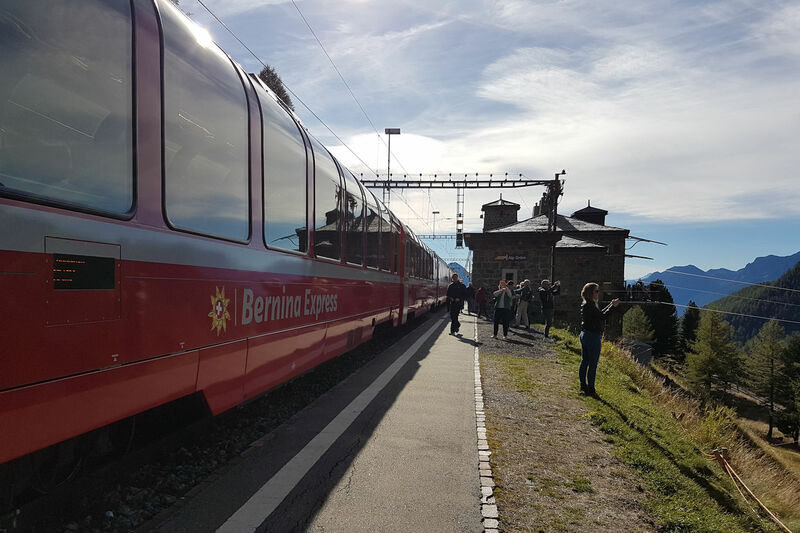 In fact, the train navigates through 55 tunnels, 196 bridges and reaches up to 2,253 meters at Ospizio Bernina. A highly recommended experience. The 136-meter-long Landwasser Viaduct is a mastery of engineering. Frequently featured on glossy brochures, the bridge is only more impressive in person. Watch your train disappear in to a mountain whilst gliding over the 6 limestone arches. 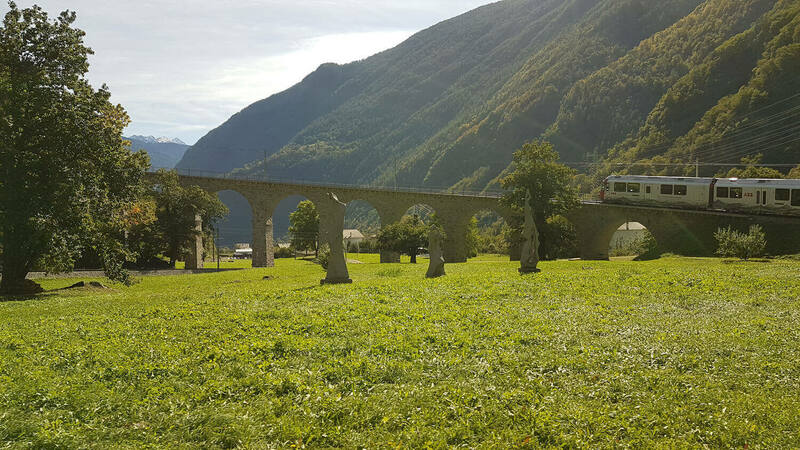 Another engineering masterpiece, the Brusio Viaduct wind in a signature shape over 110m of marvellous arches. Circling around to travel through its arches for a truly unique experience. It was built to limit a steep gradient and creates a wonderful and relaxing experience. 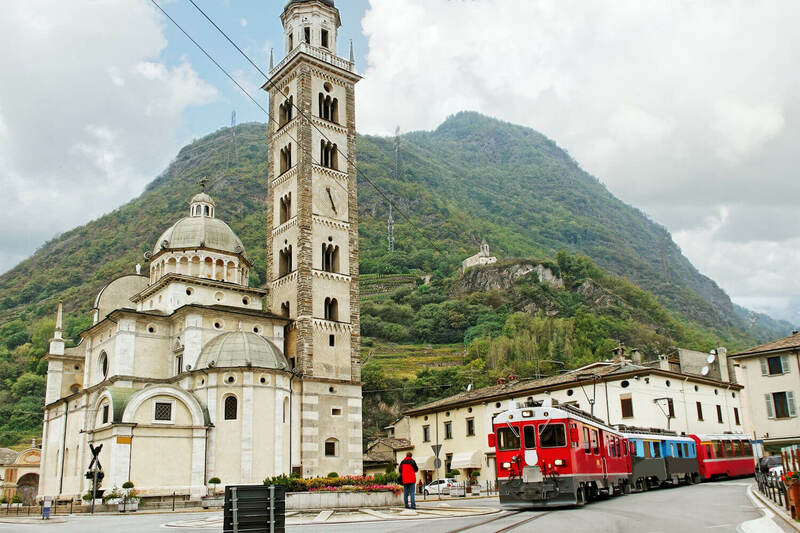 Tirano is where the Bernina ends but the Vatellina region begins. As you cross the border, the dramatic difference in culture, and climate, becomes instantly clear. With a distinct Mediterranean air everything from the cars and buildings to the food and wine was decidedly more Italian and a superb end to a fascinating rail journey. 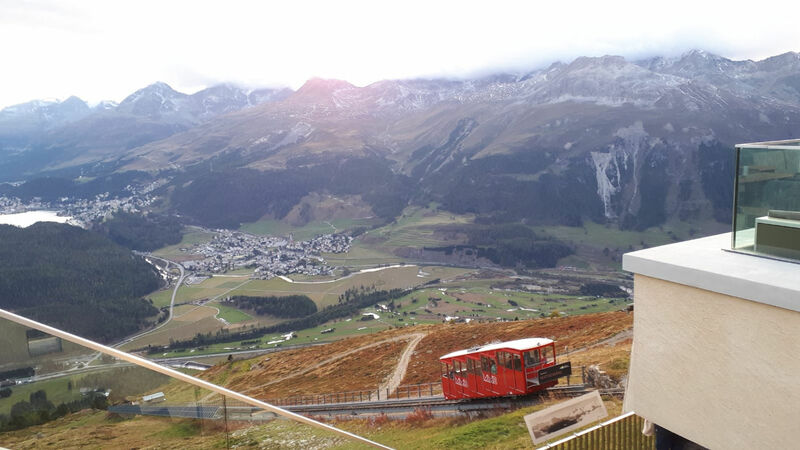 To reach Muotas Muragl you must take the scenic funicular from Pontresina. As you glide up the impossibly steep climb, views seem to get better and better. The summit of Muottas Muragl is one of the highest places in the region at 2,454m. 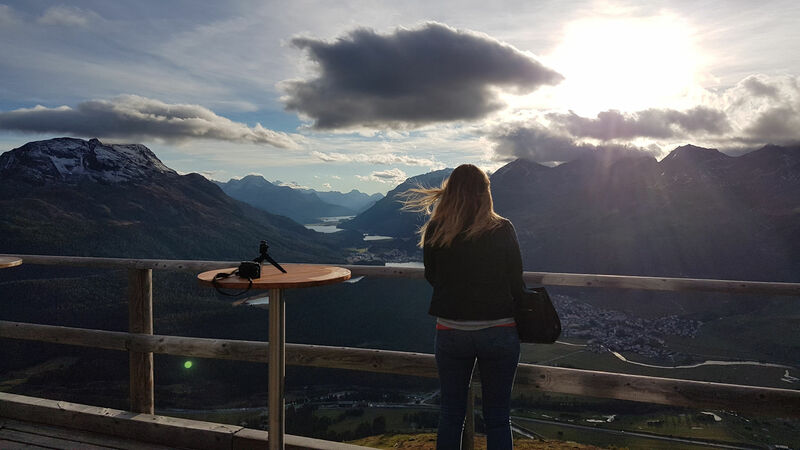 You will literally feel on top of the world as you look upon the distant St Moritz and several towns nestled in the Engadin Valley, which seem so small from there. At Muotas Muragl there is a stunning hotel with a superb restaurant. 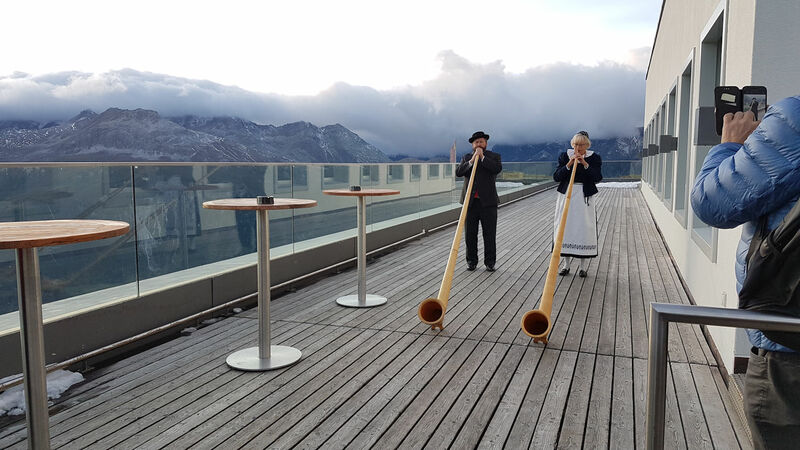 It was a particularly wonderful experience listening to traditional Alphorn players with the Engadin valley as their backdrop. With traditional dress, the players let out songful tunes and an authentic alpine experience. Capuns is a traditional dish originating from the Graubünden canton. 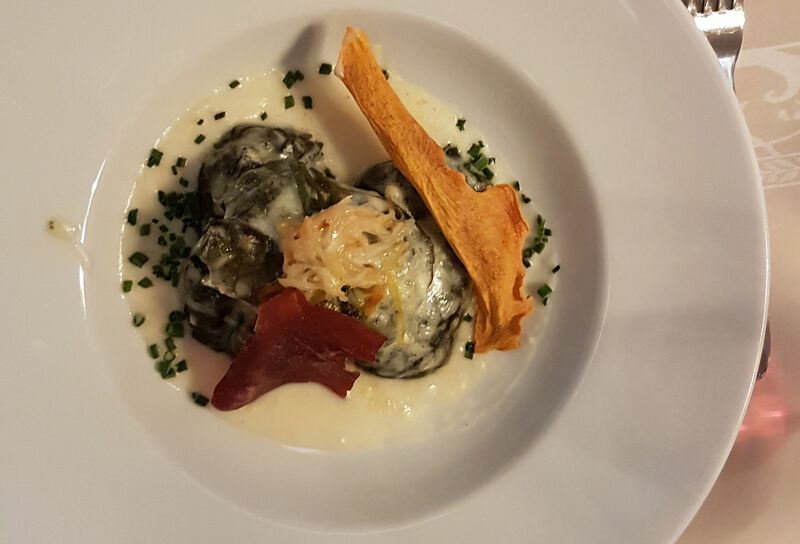 They are made from Spätzle dough with pieces of dried meat, such as air-dried beef (or vegetables) rolled in Swiss chard leaf. Try it if you dare. Referred to as a ‘herbal schnapps’ the ingredients seem so secret that the locals don’t even know what it is, perhaps even the distillers don’t know. 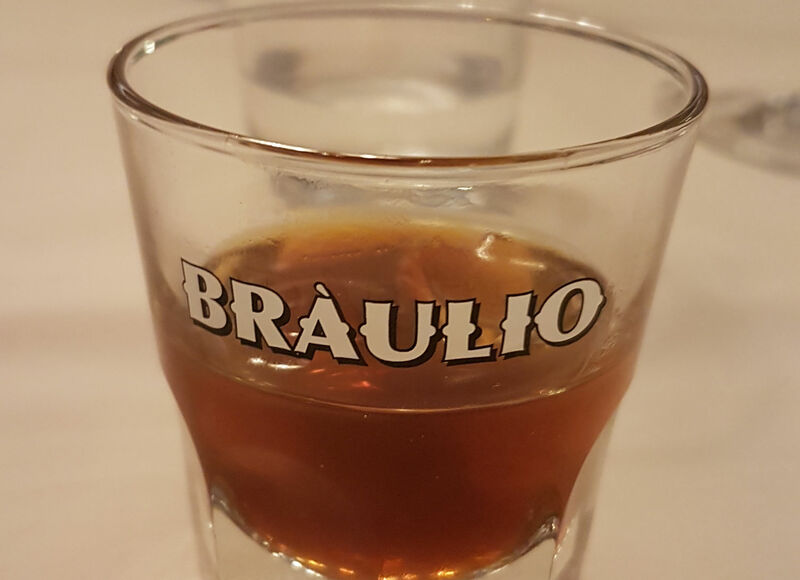 What can only be considered as Graubünden’s Marmite, Braulio divides a nation with lovers and haters, me personally, would only recommend for medicinal purposes. The capital of Graubünden, Chur is Switzerland’s oldest city. A day trip here brings fine restaurants, stunning swiss style buildings and a modern artistic flair waiting to be discovered. After a guided city tour we learned about the illustrious history that has formed the beautiful and refreshing city it is today. The clock face here is the second largest in Switzerland behind Zurich’s St Peter. Measuring at 8 meters in diameter it’s a sight to behold. 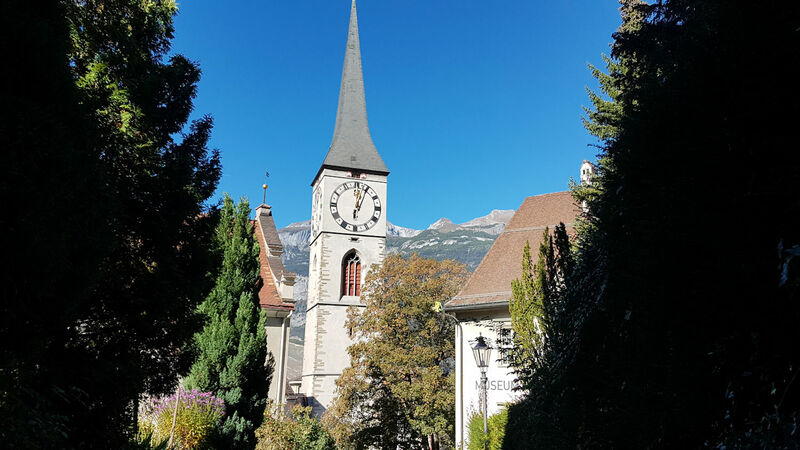 The clock sits on the ornate church of St. Martin which was completely renovated in 1990. 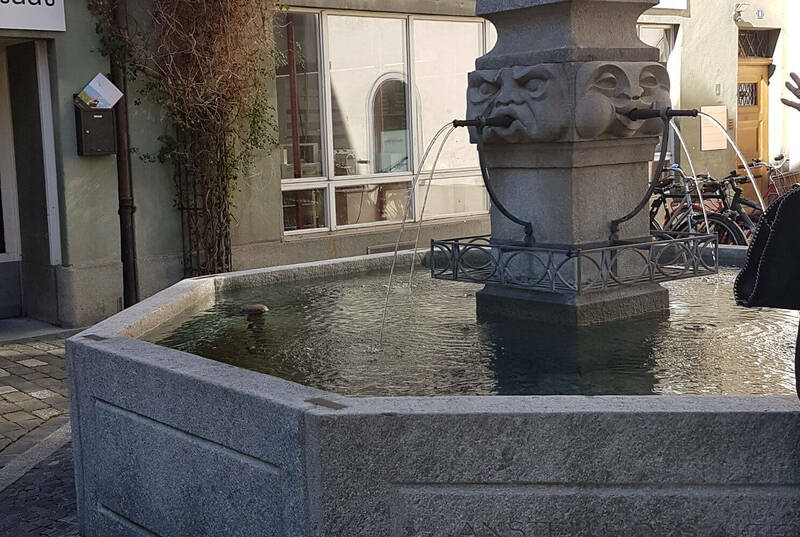 In Chur there are 20 fountains scattered around the Old Town, each with its own unique artistic design, from grumpy faces to zodiac signs. 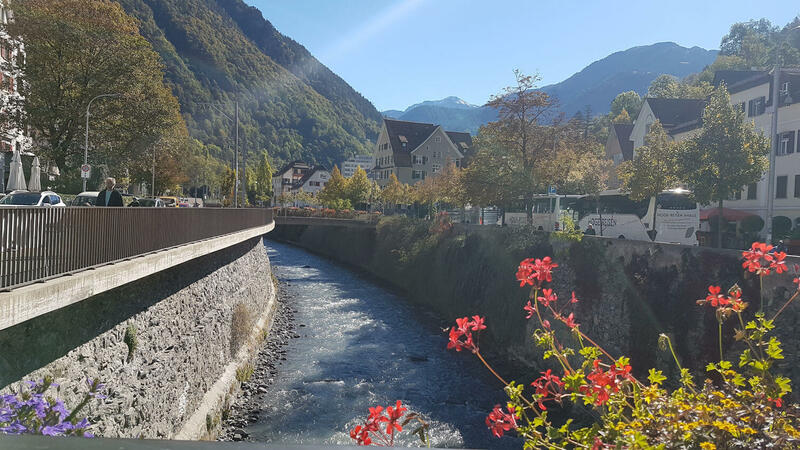 The fountains were once an integral part of life in Chur, used for everything from drinking water to laundry washing, as well as being a social centre for locals to meet. 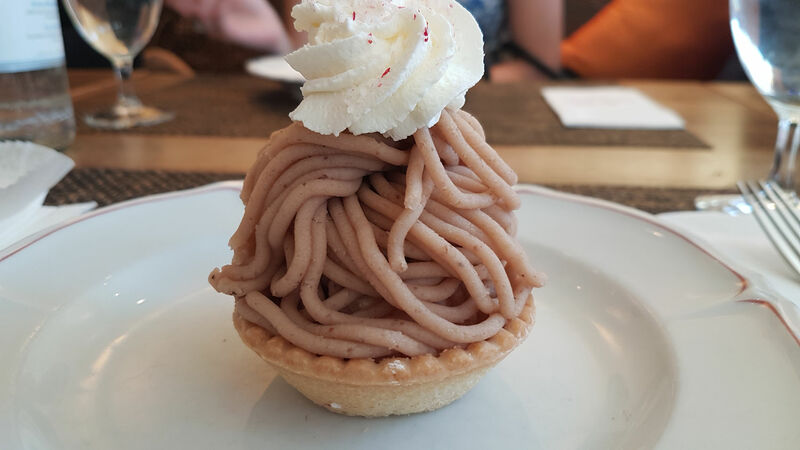 Known as Vermicelles, this tasty treat is a Swiss speciality made from chestnut puree and freshly made pastry. Served with a warm cup of tea or coffee, this tempting pie is certainly worth a try. 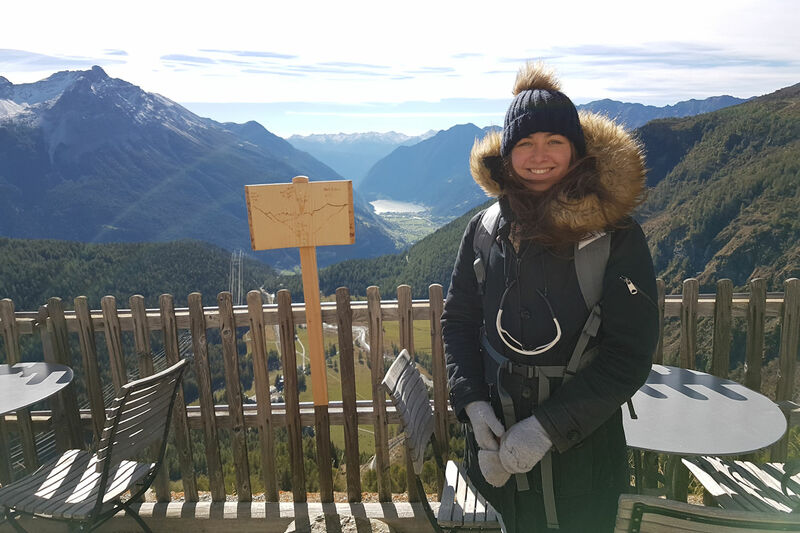 My experience of Switzerland and Graubünden was truly extraordinary and one I won’t forget. 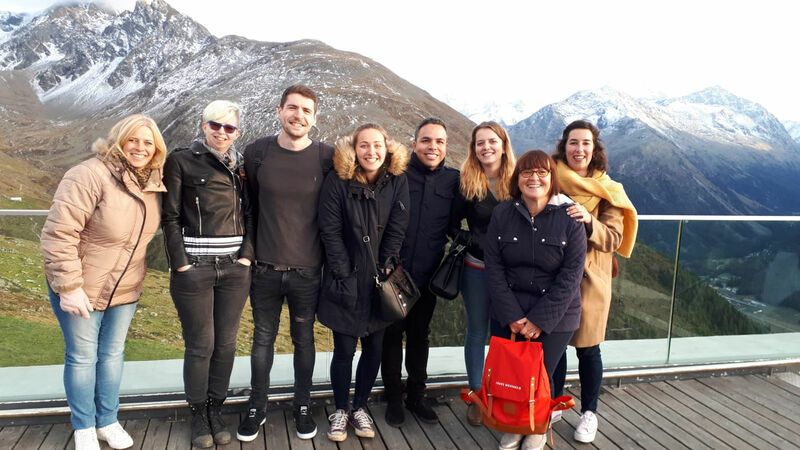 The trip was hosted by the wonderful Switzerland tourist board. From rail journeys & walks to guided tours and a wonderful group, I will certainly return. 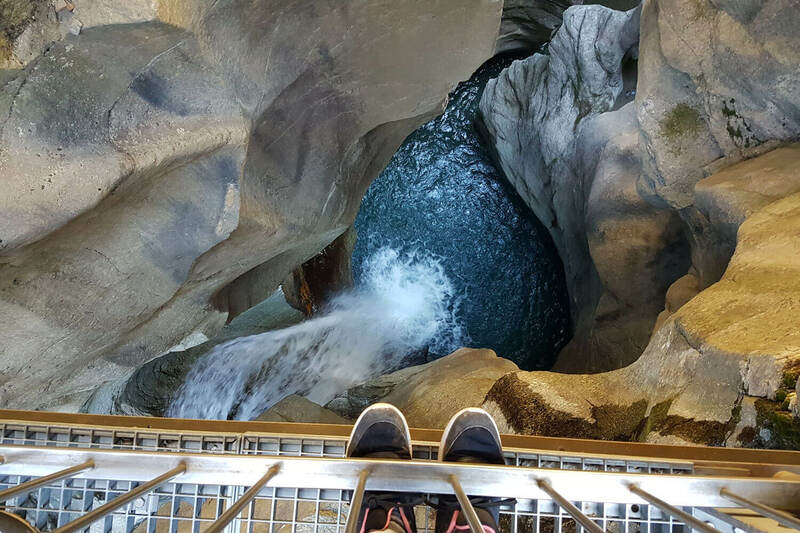 Have you been to Graubünden? We’d love to hear your stories, get in touch in the comments below.